If you’ve ever had the need to transfer files from your Android to PC you know that the process isn’t the most intuitive. iOS users have the convenience of Airdrop to share photos, documents and other stuff intuitively over Wi-Fi, but that is an iOS-only feature which leaves Android and Windows users out in the cold. Thankfully, a wonderful tool called FileDrop has just made transfer of files super easy. Let’s take a look at how FileDrop works and how you can transfer files between your Android smartphone or tablet and PC simply by dragging and dropping them. 2. Download the Windows app from the company website. On the Windows PC, you need to run the EXE file, and follow the steps outlined in the wizard. This is a clean install and should happen in under 30 seconds. Windows Firewall may block access to the tool, so make sure to hit the Allow access button when you see it. 3. On your Windows PC, you should now see your connected smartphone devices on the sync screen. Similarly, you will see your connected Windows PC on your Android. 4. To transfer files from Android to PC, just drag the files and drop them onto the respective device icons. On your Android, click inside the PC screen. This will pop out two icons, a picture icon and a folder icon. Clicking the Picture icon will display your photo gallery and transferring a file is just a matter of selecting a photo and hitting the Send button. 5. 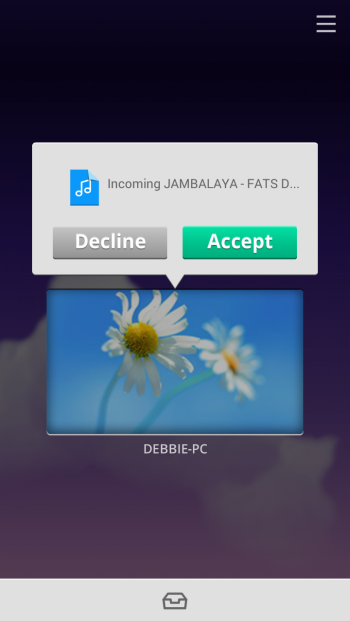 On your Windows PC, you will instantly receive a request to accept or decline the incoming request. If you accept the request, the file will be immediately transferred to it. To access the history of transferred files, you will need to hit the icon at the bottom of the window. Here you also have the option of changing the current download folder location. Similarly, you can drag and drop files from your PC to Android. Just drag files on the Android device screen on the PC and accept the incoming request on your Android to complete the transfer. As always, tapping the icon at the bottom of the screen will reveal the transferred files. You can swipe an item left to delete it and right to view it. 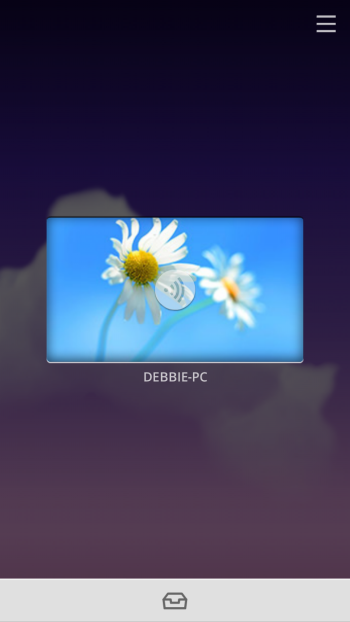 FileDrop also offers one pretty cool feature, displaying slideshows. When you tap inside the FileDrop screen and choose the Picture icon, you can select any number of images and press Play to project them as a slideshow. As usual your other device will play it only if you accept the incoming request. Another nice feature that I like is the ability to transfer files to other devices such as a company PC or a friend’s smartphone using your device or using the FileDropMe website. In conclusion, I found the whole process of file transfer to be quick, smooth and straightforward. If you have a good WiFi connection the transfers should happen in the blink of an eye. FileDrop is definitely one of the most handy ways of transferring files from Android to PC or PC to Android. Its free, its instantaneous, and is darn easy. Do give FileDrop a try and let us know what you think in the comments section. Good writeup, and FileDrop is a nice program. – To copy between mobile devices, it is not necessary to use a PC/Mac, or use the FileDrop web site, as an intermediate storage point. You can start FileDrop on the two devices, and copy data directly. I recently switched to a new Android phone, and I used FileDrop to copy about 2GB of data from the old phone to the new.